And in San Luis Obispo County that means foggy days and soft color neutrals of sand and shells and rugged browns of weathered wooden piers. More sunbleached driftwood than twinkling turquoise. (Not that there's anything wrong with that.) 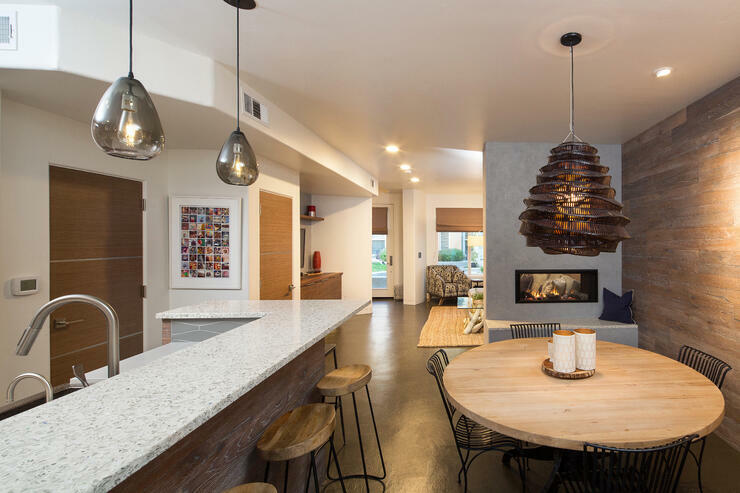 The designer used it all to create a luxury, sustainable retreat with recycled glass kitchen countertops reflecting the subtle sparkle of the Pacific. Her interior which incorporates Vetrazzo’s Martini Flint recycled glass countertops in the kitchen, three bathrooms and a fireplace hearth, is all about mixing materials: concrete flooring, plaster and wood walls, wood veneer doors, recycled glass tiles and even porcelain tile on the stair risers, all in a sandy palette. Despite the neutral colors there’s nothing beige about this home, which is actually a center unit condo. 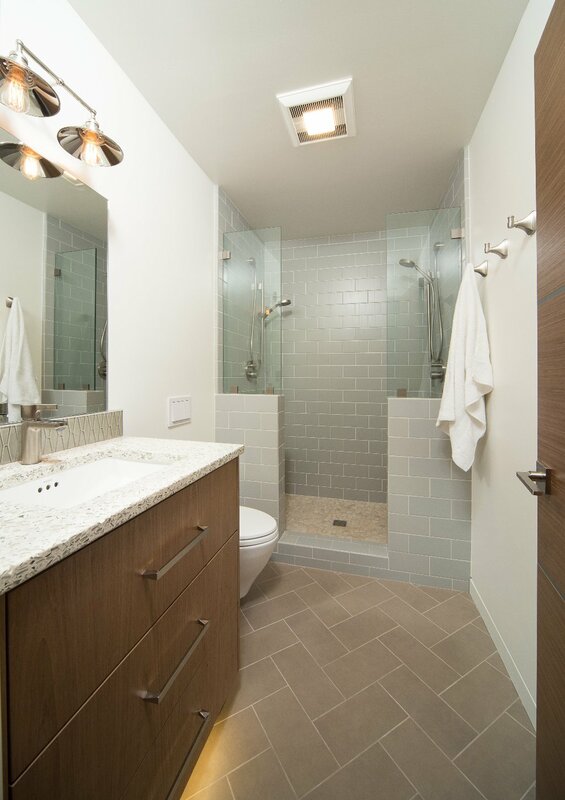 Rothbauer relied heavily on the patterns and visual texture of Vetrazzo’s Martini Flint and glass and porcelain tiles from Fireclay Tile and Oceanside Glasstile to give every room the same dose of movement and interest as the ever changing coastline. 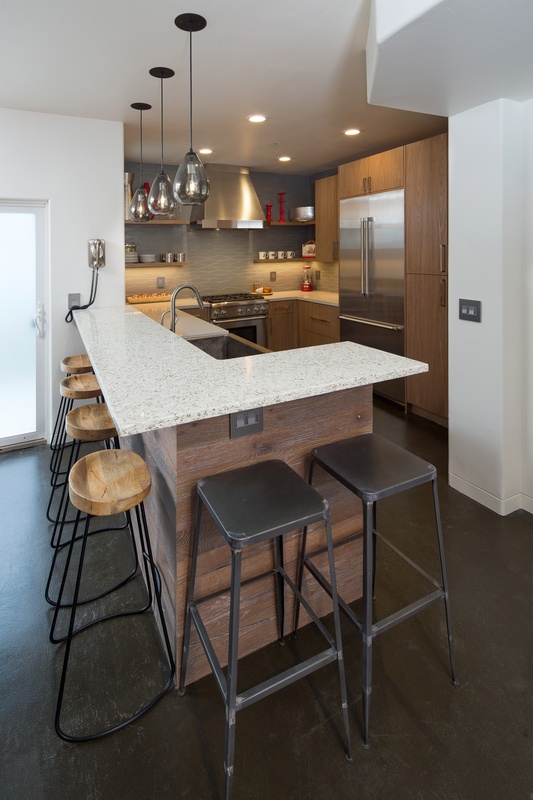 Green Goods also supplied the Vetrazzo slab for the custom upper bar top in the kitchen. The perimeter counters are quartz. Rothbauer said for the bar top she originally considered one of Caeserstone’s engineered products that had some sparkle in it.  “But it was no comparison to the Vetrazzo,” she said. 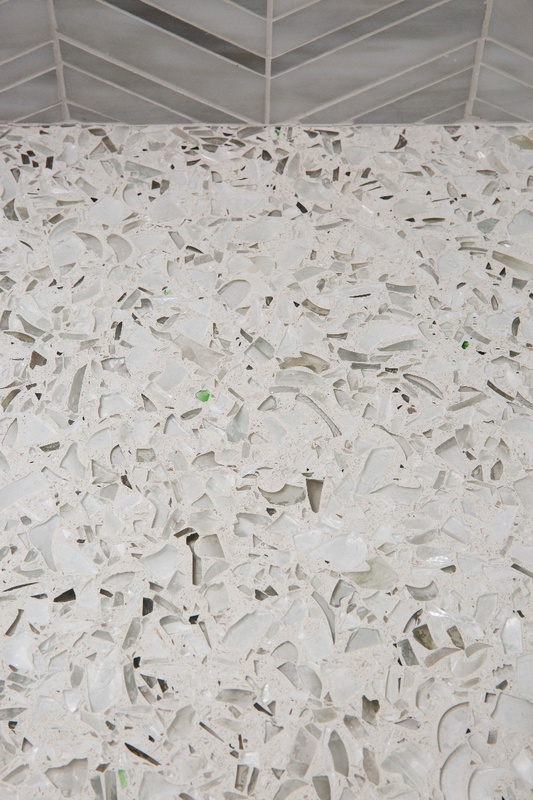 “When I saw it I said, ‘Oh, this has to be it.” Using the quartz on the worktops allowed her to make the Vetrazzo with it’s unique recycled glass composition the main focal point. 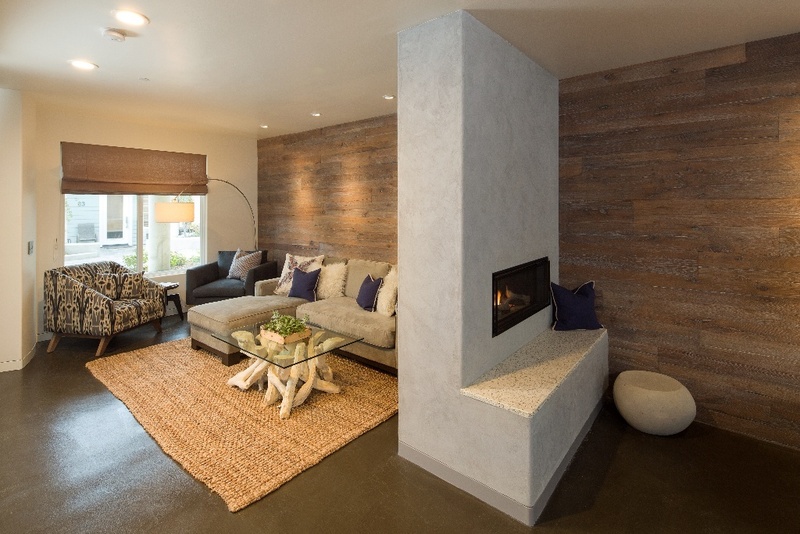 Environmental impact was also a factor for the homeowner. “We tried to do everything eco-friendly,” the designer said. 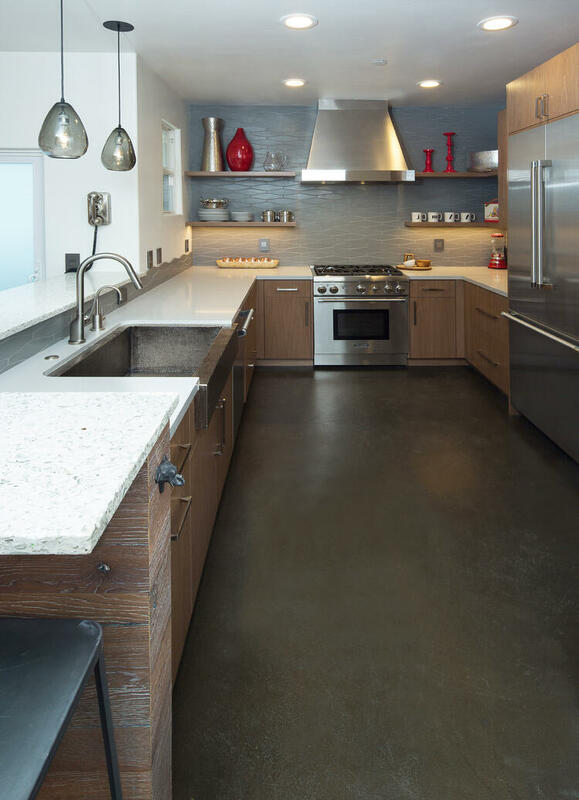 Sustainable countertops, wood veneered cabinets and recycled glass tiles were used throughout the home. 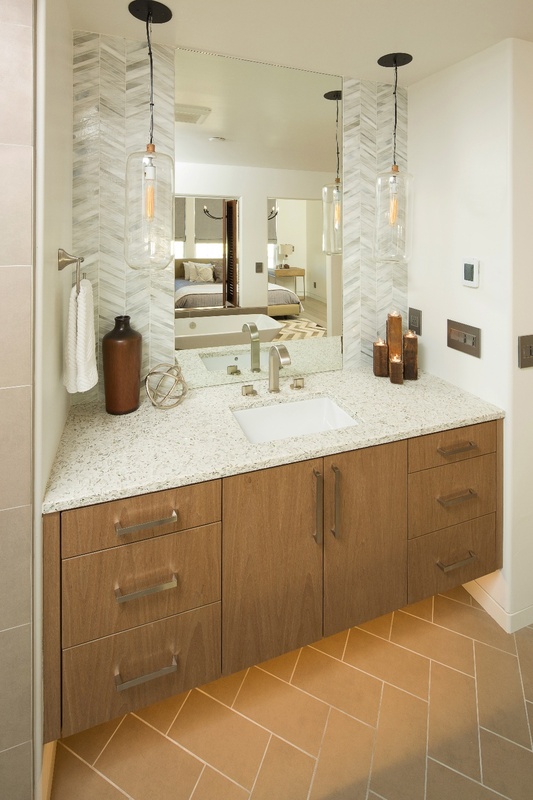 In the master bath Rothbauer picked up the glass from the Martini Flint vanity top and carried it up the wall with a herringbone tile from Oceanside Glasstile, drawing your eye up to a pair of Cisco Brothers’ pendants. 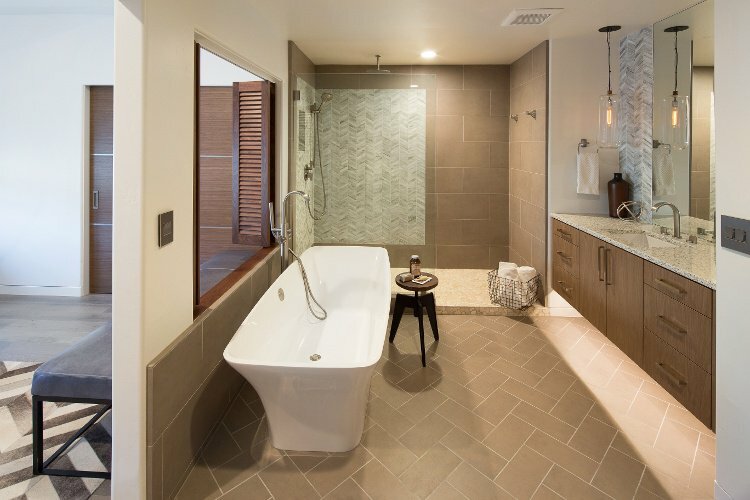 This interior bath has no windows so the designer created a shuttered pass-through from the bathroom to the bedroom to allow extra light (or extra privacy) when needed. “The bathroom on my honeymoon had shutters like that and the idea stuck with me for these last 15 years,” she said. 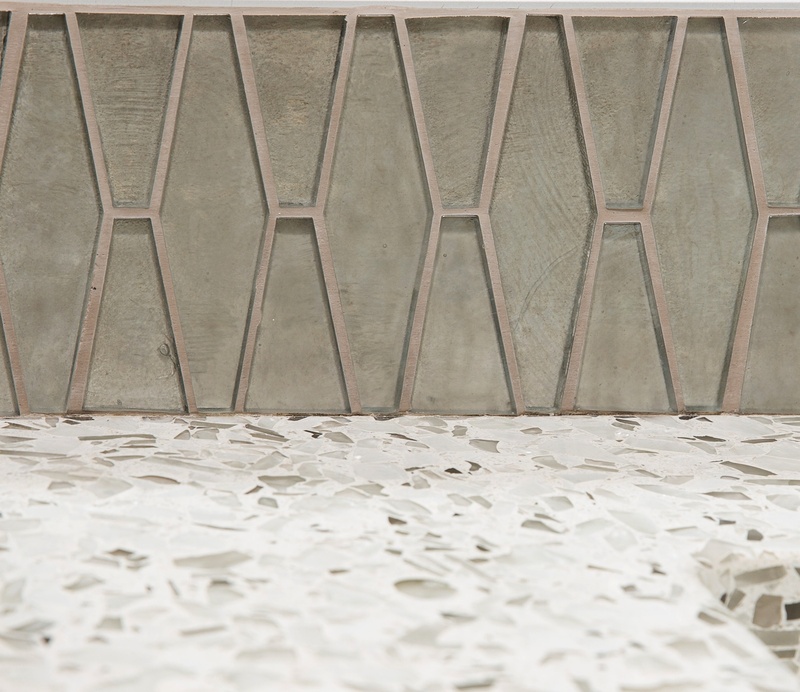 See more on how Vetrazzo slabs are handcrafted here. 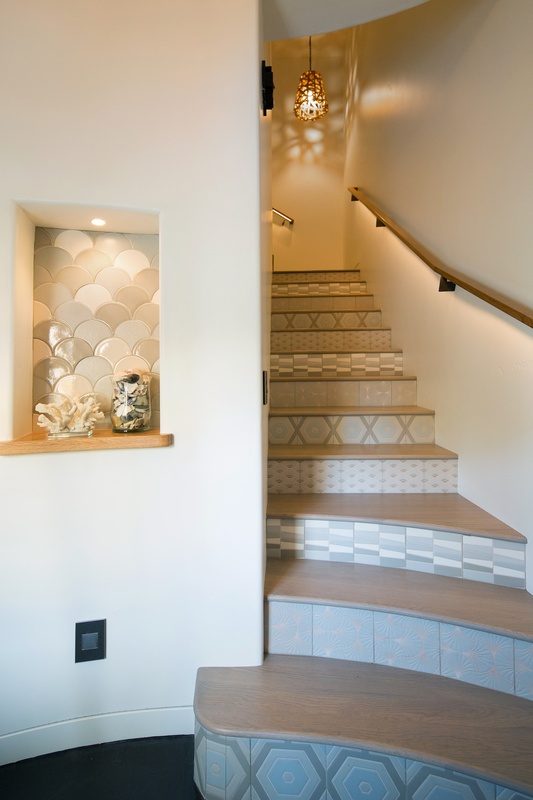 For the stair risers Rothbauer presented the homeowner and her children with tile samples in a variety of patterns, all with the same tones, and asked each to choose their favorite. The powder room has all the tones and textures of a beach escape, without saturated sea glass colors, showing the versatility of Vetrazzo;'s glass palette. 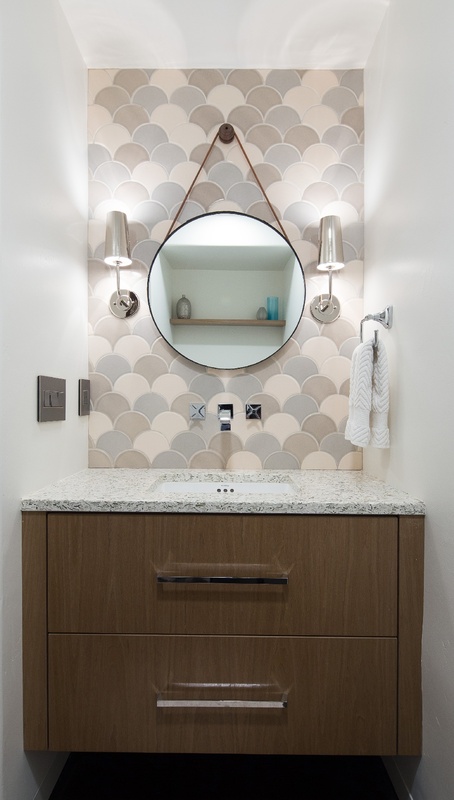 Rothbauer paired custom cabinetry from Green Goods with Vetrazzo’s recycled glass vanity top and Fireclay Tile’s Ogee Drop for a fish scale look. The project has become a living portfolio for Rothbauer. Recently she showed another client a sample of the Martini Flint, but the client couldn’t envision it in her space from just a 4x4 swatch. But when she took her to Avila Beach, and she could see how it played in the space, Rothbauer said, she was sold. All photos by Elliot Johnson. 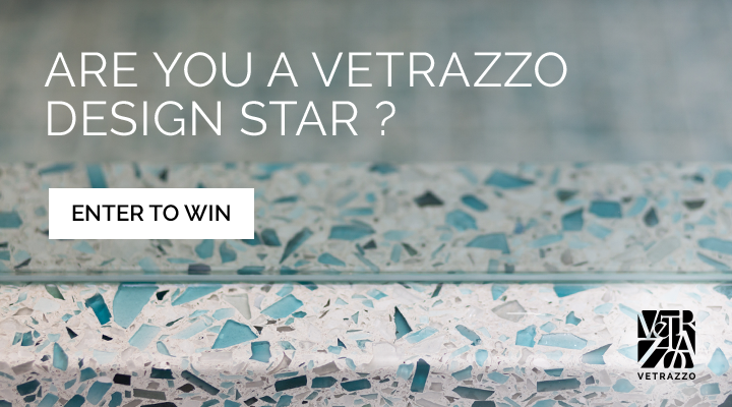 Are you a designer or architect who works with Vetrazzo surfaces? Your recent project may be your ticket to visit our Georgia Atelier to see how we handcraft each slab. Click below for contest details.